Although settled earlier, Corrigan didn't get a jump start until the arrival of the Houston, East and West Texas Railway in 1881. Pat Corrigan, conductor on the first train to arrive was given the honor of having the town named after him. The Trinity and Sabine Railway arrived the following year. Having two railroads were a boon to area lumber companies, and in the early 1880s there were as many as seventeen sawmills operating in the vicinity. A post office was granted in 1883. 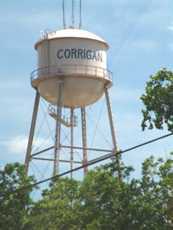 By 1900, Corrigan's population was a respectable 461 residents. Corrigan had a bottling works, stone quarries, sand pits, and of course, cotton. This diversified economy buoyed Corrigan through the hard times when the mills shut down. After the timber was nearly exhausted, particleboard plants appeared after WWII. The population reached just over 1,400 in the early 1950s, but declined to less than a thousand by 1960. It has since increased to over 1,700. 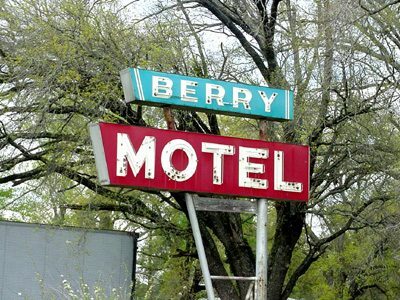 More Texas Old Neon | "Rooms with a Past"